It started to become clear after a few weeks that our new black hen (bottom right) was not a hen at all. 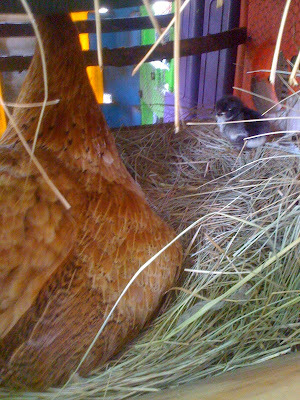 The chooks get let out into the garden for limited times - great for when it's time to dig over a bed. Mistake #1. When one of the hens became broody in early Spring I left her to sit on her small clutch of eggs. This, in retrospect was a mistake. I later read a section in Jackie French's Chook book, confirming that if the hen is broody (for a few days running) she should be put in her own special pen, away from the other chooks. Instead I left her with the others in a high nest, about 40cm off the ground. Mistake #2. The other hens kept laying and I added some more eggs to her clutch, about 10 in all - not a good idea either. It meant that the chicks would hatch at different times. I should have let her sit on just one egg, while I collected more - then taken the one away and added a fresh batch of 6-15 eggs at one time. For an inexperienced hen like mine, Jackie recommends just six eggs. Apparently you can use eggs that have been collected for up to a month after lay. Mistake #3. When the first chick hatched I realised my earlier mistake and quickly made up a new pen and tried to move the hen. Very bad idea. When I let her into the new pen she escaped in a flash and freaked out, running round the backyard. I opened the main chook yard for her and opened the hut for her and she went straight back on her clutch of eggs again - a lucky escape for me. The first chick made an appearance in the high nest, it wasn't long before it's exploring lead to a 40cm drop to soft grass below. Here's the story in pictures of my rescue attempt. 15th November 11:44am - 2 of the chicks from the clutch of 6 appeared close to fully developed, showing movement, though not much. The other 4 chicks did not survive. 15th November 1:30pm - I got a cardboard box and hooked up a 75W incandescent light bulb to keep the chicks warm. They were quite cold. I was aiming for a temperature of 37ºC and used a thermometer and adjusted the box lid to reach the right temperature. I used an eye dropper to give them some water. 15th November 4:45pm - One of the chicks was quite active, the other wasn’t. I decided to leave them in the box overnight and see how they fared in the morning. 16th November 6:00am - after staying the the warm box overnight both chicks were lively. I thought they could join their family and hoped that their mother would take them under her wing. 16th November 8:00am - I introduced the chicks to their mother and siblings. She was a bit unsure initially, but accepted them thankfully. 17th November - I kept the mother and chick separate from the other chooks and rooster. 6 happy chicks with their mum. I made a drink station for them, auto refilling and shallow so they can’t drown. Being low it does fill with scratched grass so needs to be checked often. Thanks for the story, Richard. Our chicks should be hatching tomorrow, and I also added a few fresh ones to the clutch 2 days later than the rest…I may need to do a rescue stint similar to yours (though I wouldn't have thought of it myself). I will definitely set up one of those water bottles as well. And keep you posted.